Leave the #post-fact / #post-truth-society in 2016! We do not live in a #post-fact or #post-truth-society. We should really stop normalizing this sentiment!! If we know something to be a lie or false, let’s call it that instead of coming up with catch phrases to rationalize and become comfortable with – well….it’s true enough. The earth is flat or the earth is the center of the universe. How many people were imprisoned and perhaps killed as a result of questioning this false assumption? Galileo is just one famous example. Black people are genetically inferior. How many people have been treated as less human because of that? The slave trade is one example. Skulls and remains of Afrikans were displayed in European museums (some only returned recently), by those who went to repulsive extents to prove preposterous claims, is another. Consider what happened to the Herero and Nama of Namibia in 1904 and the ramifications of that to today. Look up the case of Saartjie Baartman of South Africa and see what damage the falsity of inferiority brought. How about cigarettes/nicotine not being harmful? 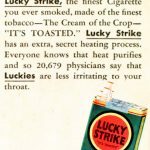 Advertised as healthy and endorsed by doctors even when manufacturers knew of the addictive properties and side effects. Invade Iraq because their biological and chemical weapons (weapons of mass destruction) pose a clear and present danger to the word. Fast-forward to present, how many lives have been lost as a result and the distabilasation that followed? We are not in a #post-fact or #post-truth-world. Yes, there are very many influencers that argue for this perspective. Paul Krugman’s piece in the New York times, The Post-Truth Campaign is just one example. I disagree with this phrasing that has entered and is being accepted into the vernacular especially in the US with a sense of resignation. I hear it on TV, read it in newspapers and heard it the other day on National Public Radio (NPR). It is true that we are in a world were some are either comfortable with true enough or do not care when they are not telling the truth. The world has always had people like that, those who stretch the truth. The majority of us, if we are honest, can recall instances when we have not been completely honest or said things that were false. The difference is that in the past we called things rumors when they were not true and relied on news outlets to do fact checking and not print or broadcast things that they knew were not true. Now many news outlets spend hours discussing things that they know to not be true. This is combined with many of us on social media who are more concerned with seeming engaged and being perceived as being well read, all the while taking cover under the blanket of “sharing or RT doesn’t equal endorsement”. Instead of calling out falsities for what they are, terminologies are being coined to explain what is being viewed as a novel phenomenon. Whether it is in promoting or proclaiming absurd ideas/solutions in education or in politics, lying is not a new phenomenon. While it may be a good academic exercise to find a term that explains what is happening, we need to be careful not to normalize things that cause harm. We need to stop making acceptable that which is or should be unacceptable. Hopefully we leave the #post-fact or #post-truth-society concepts in 2016. PrevAre we talking about the same thing?